Since late November, huge crowds have been camped out in central Kiev, opposing the government's partnership with Russia and calling for early elections. But a small number of protesters are thought to have a more violent agenda. The BBC Ukrainian Service looks at this little-known far-right group, the Right Sector. In the early days of the protests in Kiev, the most radical activists on Independence Square created the Right Sector movement, which took an active part in the clashes with police on 19 January. This group consists mostly of young men with right-wing views. They come from different regions of Ukraine, and there are both Ukrainian and Russian-speaking people among them. They have no permanent place of deployment in the protest camp on Independence Square. For some time, they were based in the City Hall building which was captured by the protesters in December. They usually wear masks, helmets and protection for their hands and feet, and carry sticks or iron bars in case of confrontation with riot police. According to some members of the Right Sector, the movement incorporates several far-right groups including Patriot of Ukraine, Trident and others. However, one of the Right Sector activists, known as Neil Khasevych, told the BBC that none of those groups were formally affiliated with the movement. He said the Right Sector was an autonomous organisation with no leaders or formal membership. Their actions are mostly spontaneous, but the activists were preparing to take part in violent actions from the beginning of the protests, he said. The backbone of the organisation in Kiev is formed by Russian-speaking football fans sharing nationalist views. To communicate with its supporters, the Right Sector uses the website of the nationalist organisation Trident, and pages on Facebook and the social network Vkontakte. Most of its activists have a negative attitude towards Russia's government and are against Ukraine joining the Customs Union. But unlike other protesters in Independence Square, most of the Right Sector activists do not support the idea of joining the EU, which they consider to be an "oppressor of European nations". The organisation believes the current situation is an opportunity "to destroy the state skeleton" and start building a new state. The Right Sector does not associate itself with the parliamentary opposition parties, including the nationalist Svoboda, which it considers to be too liberal and conformist. 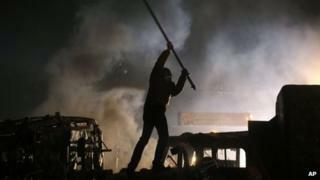 All three opposition leaders, including former world boxing champion Vitali Klitschko, have criticised the Right Sector's attack on the police lines and dubbed the radical activists provocateurs. The Right Sector issued a statement saying that the new anti-protest law approved by parliament on 16 January - which among other things banned the wearing of helmets and masks during the demonstrations - has "ended the Ukraine's aspirations for a peaceful solution of the crisis". Ukraine crisis: What's going on in Crimea?